How Did Crimean-Congo Hemorrhagic Fever Get To Spain? : Goats and Soda The Ebola-like virus is found mainly in North Africa, the Middle East and Central Asia. 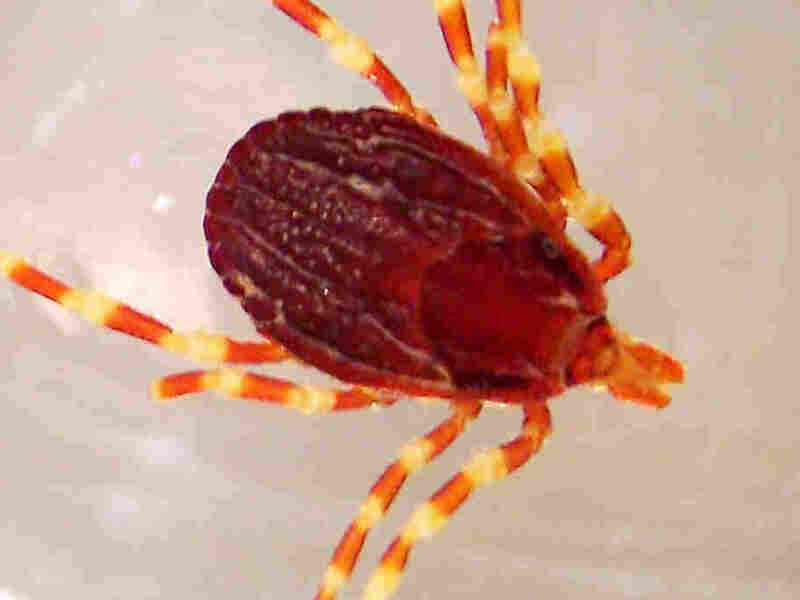 Ticks of the genus Hyalomma, pictured here, are principally responsible for passing on Crimea-Congo hemorrhagic fever to humans. How did Crimean-Congo hemorrhagic fever come to strike in Spain? And how worried should we be? That's the question a team of epidemiologists and microbiologists has been trying to answer for the past year. The disease is a tick-borne, Ebola-like virus. Because it's a lesser-known illness, it is often misdiagnosed. So there aren't very good official statistics on the number of cases in many parts of the world. It's normally found in North Africa, the Middle East and Central Asia. But in 2016, two cases cropped up in Spain. Last September, a 62-year-old man in Madrid died after being bitten by a tick while walking in the Spanish countryside. Doctors determined he had contracted Crimean-Congo hemorrhagic fever, which causes headache, fever, nausea, bruising and bleeding. In severe cases, patients experience sharp mood swings and confusion as well as kidney deterioration or sudden liver failure. Up to a third of patients die, usually within two weeks of contracting the disease. There's no vaccine. The only proven treatment is supportive care — making sure patients get enough fluids and are well-monitored as their bodies fight the infection. The second Spanish case was a 50-year-old nurse who treated the man. She contracted the illness herself but recovered after being treated with an anti-viral medication and several rounds of blood transfusions. This was the first time the disease had shown up in Western Europe in two people who had not traveled to an area where the fever is endemic. In a study published Wednesday in The New England Journal of Medicine, researchers speculate that the ticks carrying the virus sneaked into Europe by latching on to migrating birds from Morocco or imported livestock. The strain of the virus that infected the two Spaniards was closest to the strains found in North Africa. But no one knows exactly how or when the virus hopped over to Western Europe. "It's hard to make conjectures as to why it happened, since this was only a pair of cases," says Dr. Albert Ko, who chairs the Epidemiology of Microbial Diseases Department at the Yale School of Public Health. "And it's too early to tell if it's really going to be a big public health problem," says Ko, who was not involved in the NEJM study. But it's important for public health officials and medical professionals to monitor the situation, he adds. "It's only a couple of cases now," he says, "but that is where Turkey was 20 years ago." By 2015, Turkey had documented 10,000 cases — and the disease continues to spread there and infect more people. Afghanistan is another flashpoint. Last year, health officials warned that livestock slaughtered for the Muslim holiday of Eid al-Adha might be ridden with Crimean-Congo-carrying ticks; the Health Ministry reported more than 60 cases of the virus. The disease has also spread to India, Pakistan and South Africa. Ko says that it's important to monitor how and where the disease is spreading, but he adds: "The overall risk to the human population still appears small at this point. We don't appear to have an epidemic at this point." "The most important thing is awareness among health care providers about the symptoms," Ko says, "so they can stay ahead of the disease." Maanvi Singh is a freelance writer based in London. Contact her @maanvisings.